Very few game series manage to become an influence for games that come after them without receiving proper sequels. The Jet Set Radio series by SEGA is among them, an incredibly stylish series which has yet to receive a proper, next-gen sequel. 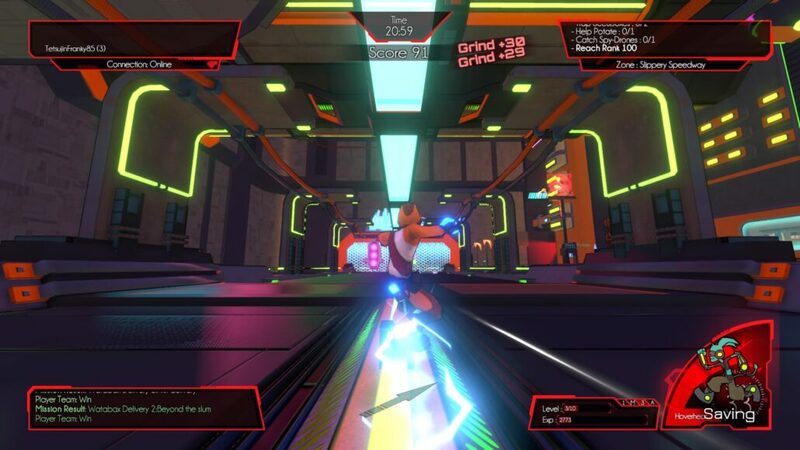 Hover, by Midgar Studio and Fusty Game, tries hard to be the true jet Set Radio game of the generation but it sadly fails short to do so due to several issues. Hover is set on ECP17, a city on a far away, unspecified planet that’s also known as Hover City. The Great Admin cut off the communication with the Galactic Union, establishing a dictatorship and making all forms of entertainment illegal. While most of the city obeys its ruler, a few of them decided to rebel, to bring back the fun to Hover City and end the despotic rule of The Great Admin. The rebels, known as Gamers, use their high-tech suits and gear to sabotage the dictator’s propaganda, reach the Orbital Station and let the Galactic Union know what is happening in the city. Hover’s story is not one that should be taken too seriously, but the game does very little to make players feel part of it. The story’s development is extremely unfocused, characters aren’t well developed and it doesn’t take long for players to forget why they are doing what they are. It’s a shame, because the setting is incredibly stylish, and it could have been used so much better. Hover’s gameplay, sadly, isn’t much better than its story, or lack thereof: the core gameplay and mechanics are more than solid, but it’s everything surrounding them that feels quite lacking. At the beginning of the game, players will be able to create their own character, with additional options for cosmetics and classes becoming available only later on. The limited initial character creation options do make sense in the context of the story, but a few additional ones would have helped. Once the character is created, players are thrown into a tutorial area which explains the basics of the parkour gameplay experience and several other mechanics, such as energy, which allows the character to run faster and jump higher, and growth mechanics, which allow players to customize their characters with modifier chips once they level up and unlock additional slots. Customization possibilities are quite varied, so there’s plenty of fun to be had in this regard. One extremely useful mechanic is the ability to undo a few seconds of movement, allowing players to get back where they were before a missed jump. Once out of the tutorial area, players are thrust into Hover City, and here the troubles begin. As for the story, things are extremely unfocused in the city, due to mission design. 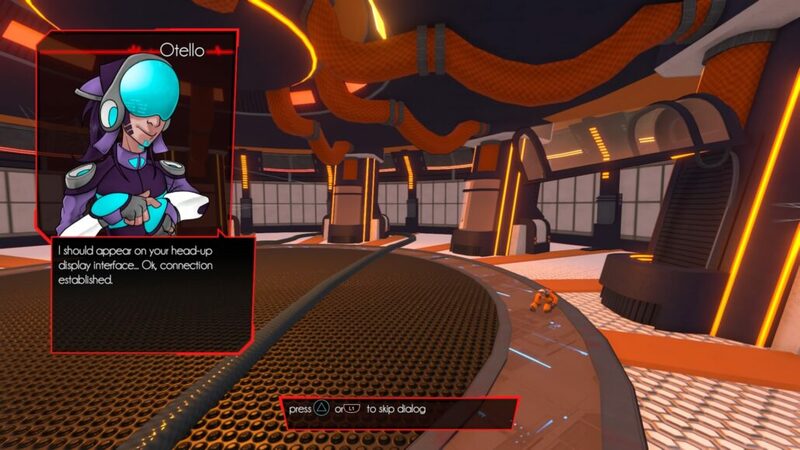 There are a few different types, but the best ones are definitely the racing missions, as they play right into the game’s solid core gameplay: during these missions, players will have to reach a variety of checkpoints as quickly as possible. The other mission types are way less enjoyable, especially Gameball missions. During these missions, two different teams will have to pick up a ball and launch it at the opponents’ goal. Due to the controls and to how the game is played, completing these missions without a specialized Gameball character is very, very frustrating, even more considering many of them are required to progress the story. Making matters worse is the fact that specialized characters, who make some of these types of missions easier, are only unlocked after completing them. While Hover can be enjoyed in single player, the game also comes with a multiplayer mode where players can join together to complete missions and even compete against one another. The same issues as in single player, however, stand, and Gameball is just as irritating and frustrating. The console release of Hover doesn’t bring any major change over the PC release, outside of support for gyro aiming available on PlayStation 4. In some aspects, the console version is somewhat worse than the PC release, mostly due to performance. On a regular PS4, the game hardly keeps a steady framerate and often dips well below 60 FPS. In a game that requires some quick reactions, this is far from ideal. The underwhelming performance is definitely a shame, as Hover’s presentation, while heavily inspired by the Jet Set Radio games, is very well done, with Hover City looking massive and extremely detailed. The soundtrack is also quite nice, with Hideki Naganuma (composer of the Jest Set Radio games soundtrack) providing some excellent tracks. Everything considered, Hover is not a bad game at all, as its core gameplay and mechanics are quite solid and can provide fans of the Jet Set Radio games plenty of fun. Sadly, the unfocused nature of the game’s narrative and gameplay experience can make it quite frustrating, preventing Hover from being the true successor of the classic games made by SEGA. Reviewed on PlayStation 4 (code provided by the publisher). You can purchase Hover for Xbox One, PC, Nintendo Switch and PlayStation 4. Hover had all the right qualities to be the true successor to the Jet Set Radio games, with solid high-speed parkour action, a stylish presentation, and an excellent soundtrack. Sadly, these do little to alleviate some of the game's biggest issues, such as unfocused narrative and bad mission design, issues that prevent the game from being nothing more than an acceptable title.